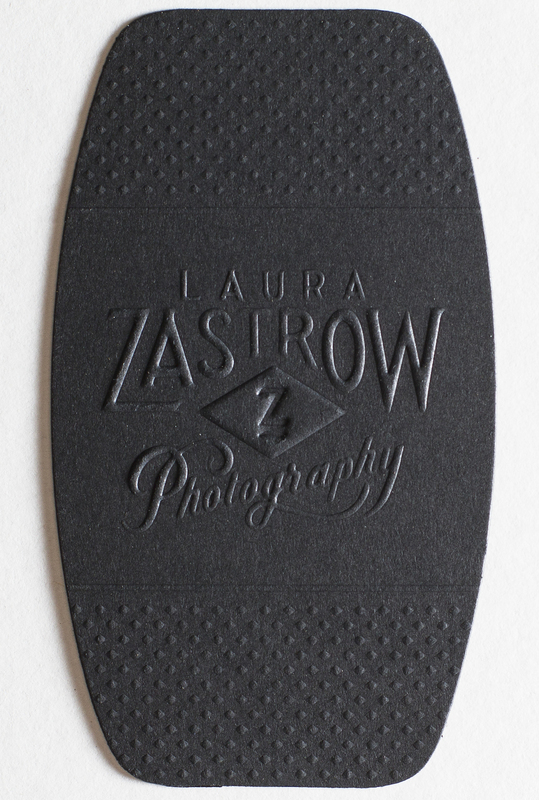 Take your business cards to the next level with custom embossing! 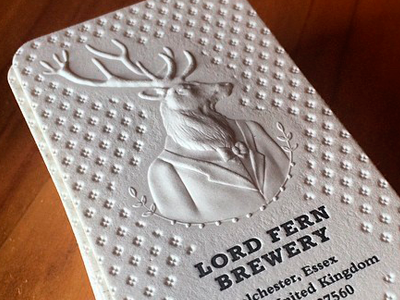 The raised impression of embossing adds class and finesse to your design. Not only is it a truly eye-catching effect, but will make an impact through the raised texture of the business card itself. Embossing makes elements of your business card literally stand out, raising areas of one side of the card as specified in your design. The opposite effect, having an impression on one side of the card is called Debossing. A unique aspect of this printing technique is that you cannot have one effect without the other also being applied to the card. An embossed design will create a reverse impression, deboss, on the back side, while a debossed design will create a reverse raised effect, emboss, on the other side. Designed by the Pitch Design Co. 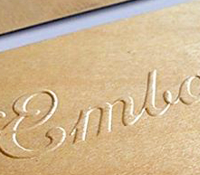 If there is a specific stock you are interested in embossing, please request a Print Quote and one of our Estimators will get in touch with you. See: Embossing and 3D Emboss, Blind and registered Emboss. We can emboss a wide range of stocks and materials. The best stocks for embossing are soft uncoated stocks (such as our 20pt Cotton) or for fine detail embossing, uncoated stocks 16pt or less. What is the best stock for embossing & debossing? Thinner and softer stocks show the detail of an emboss and deboss much better than thicker, rigid stocks. Uncoated stocks also generally hold these details better. That being said, greater depth of the raised area or impression can be produced with thicker soft stocks, like our 40pt Cotton. Since the thickness will make fine details less visible, designs for emboss and deboss should be more simple, bold and have no fine detail. Thicker coated stocks will not be as suitable for fine detail or deep impressions, therefore the design for these stocks should be created with this in mind. The impression of an emboss and deboss will show through on the reverse side. This means that any printed content that is directly behind the emboss or deboss will be affected. To avoid this, we recommend a duplex product where two stocks are mounted together. The side to be embossed or debossed will be produced first and then mounted to the second sheet to hide the impression. Note that a duplex product with emboss will reduce the quality of the impression due to the mounting process, so it is best to work around the emboss and go with a single ply product. Please note that there are strict design considerations for these projects that one of our Print Specialists or Prepress agents will need to review with you first. You can speak to one by contacting 1.888.667.0067 - selection 4 or 5. See: What are your paper options for duplex (2-ply) business cards? What is the difference between Embossing and 3D Embossing? Standard/regular embossing. One level of impression. 3D Embossing has a higher cost than standard Embossing, as it one of our most specialized print services and most expensive options. Please note our 3D Emboss technique does not allow for a 2-ply card in combination with this process. There cannot be any design or print on the back side of a 3D Embossed card, and you cannot hide the impression visible on the back side of the card. 2-ply options are available for regular Embossing only. You can also print on the back side of a 1-ply order that includes a regular Emboss. 3D Embossing is a specialty type of embossing. Standard embossing offers one level of impression; with 3D Embossing the indent can be sculpted and gradated, with different levels and shapes. This means the emboss layer is supplied in a separate file (or separate page) of your press-ready PDF file. See: Setting up press-ready separations file. For 3D embossing you will also need to provide a text file (exported as a PDF file) including a description of how you would like the 3D elements produced. 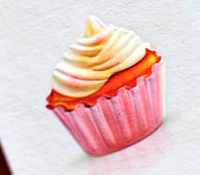 See: Example of a File for 3D Embossing. Emboss print-ready files should be supplied as separations. Before you create a press-ready file for your design, be sure to carefully read through Design Considerations for Embossing. 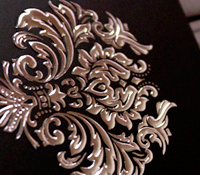 The finest detail for embossing is largely dependent on the paper stock – thinner uncoated stocks hold fine detail when embossed the best, while thicker rigid or coated stocks do not hold fine detail as well. The thickness of the paper as well as the rigidity will affect how fine of detail is suitable in your design. We offer a very wide range of stocks, each of which may affect the way your embossed detail turns out. As such we do not recommend to place an embossed order "run-as-is" unless it is a repeat order. Choosing the "online PDF proof" option before production will give you the benefit of our Prepress Team's review of your files - they may make recommendations to change your design to better suit your chosen stock. If you are ordering a custom job please make sure you upload files with your quote request so an Estimator can let you know if they think the chosen paper stock will not be suitable. Fine detail can be as small as 1pt on soft uncoated stocks 16pt or thinner. Coated stocks and thicker uncoated stocks can be more rigid and will have lower tolerances for embossing, meaning details in the design will need to be larger. Although increasing your line weight may make the design look thicker than desired, it is important to keep in mind that the embossed effect is visually thinning due to the curved surface of the emboss. Embossed artwork appears thinner than it does when viewed as a flat design. We recommend to choose sans-serif fonts as the font size will not need to be increased as much to meet the minimum line weight as it would with serif fonts. if your design is to be blind embossed (not registered to ink printing) it is highly recommended to use a thicker line weight, since the effect of a blind emboss is much more subtle. Small embossed text registered to ink printing can still be readable while this same text created in a blind emboss may not be legible. Spacing between printed elements should also be kept at a minimum 1pt. If you're using negative space for your artwork, the minimum recommended line weight is increased to 2pt. 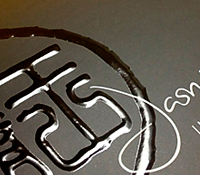 The finer the detail in your artwork, the less precise the registration of ink printing to embossing will be. 2pt line weight or higher generally has better results for registered embossed designs. The larger you can make details in the artwork for embossing, the more impact it will have, so we do not recommend a large amount of fine detail. Fine detail refers to the line weight used in your artwork, and includes the small dots and serifs on fonts. What is the depth of an Emboss? Note that due to many factors and variations in production, the depth of an emboss cannot be guaranteed. The depth of an Emboss largely depends on the type of stock (its elasticity and structure) and typically ranges between 0.5 – 2 millimetres. 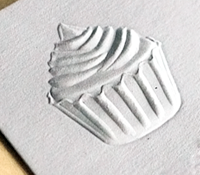 A 3D Emboss impression can be up to 0.2 inches (restrictions apply). What is the difference between Blind and Registered Embossing? The embossed element is not printed with ink. The emboss is not aligned to any graphics. 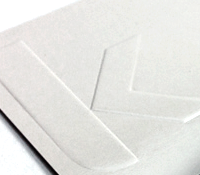 The embossed element is printed first, and then embossed in alignment to the printed element. 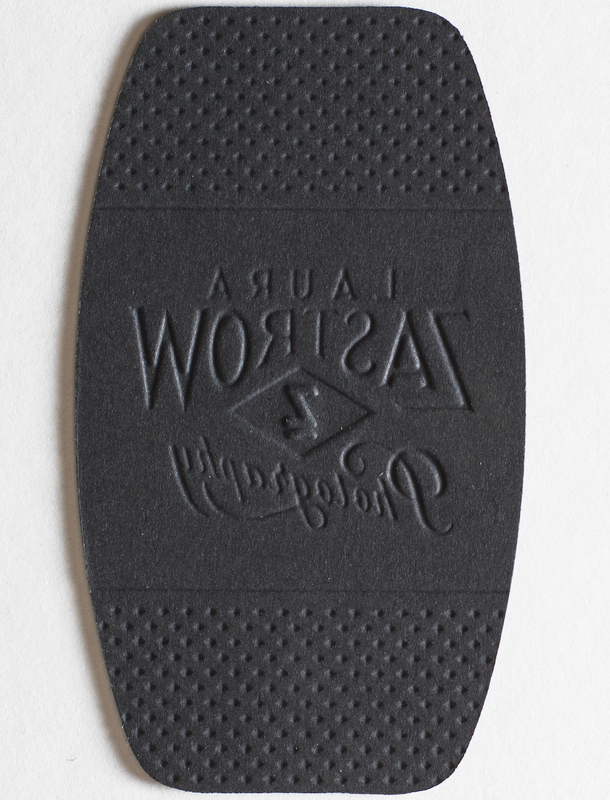 The embossed element is printed in Spot UV, and then embossed in alignment to the Spot UV. Debossing is the opposite embossing and can be categorised in the same way: Blind Debossing and Registered Debossing. 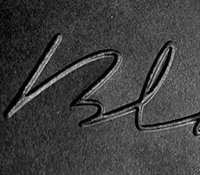 Since a blind deboss or emboss will have a much more subtle effect than it does when registered to a printed image, blind embossing is not as suitable for fine details, especially small text. Will an emboss / deboss show through to the back of a card? Embossing will show a reverse impression on the opposite side of the stock (deboss), while debossing will show a reverse raised design on the opposite side of the stock (emboss). This is important when embossing or debossing text, as it will only be forward reading on one side of the card. See image below depicting an embossed design for text. The back side of the card shows an opposite debossed effect. To avoid the back of the stock being affected, you can order a Layered card (2PLY) that will hide the opposite effect of the debossing or embossing inside two cards that are mounted together. Please note that "blind letterpress" is a different process that is used to create an impression and although it is similar to a deboss, it has a more subtle effect and will not create an emboss on the opposite side. "Show through" with this process will still be visible, but the level will be dependent on the thickness of the card (for example, the "show through" will be less on a thicker/stronger stock). Below is an example of a 3D emboss with letterpress. 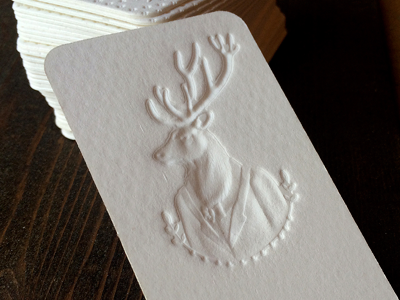 The 3D embossed area (deer) shows an opposite impression (deboss) on the back side of the card. The letterpress, both printed (Lord Fern text) and blind (background pattern) can only be seen subtly on the back side and does not create an opposite emboss. The back side of a card will be affected by both embossing and debossing processes. The finest detail possible for an emboss is 1pt. Some stocks such as more dense or coated stocks have lower tolerances for embossing, so details will need to be larger. Other factors, including blind embossing vs registered embossing will affect how fine the detail should be in your emboss design. See: Finest Detail for an Emboss. The safety margin for embossed artwork should be kept at least 0.125 inches away from the trim lines on all sides for most orders. A 2-ply embossed order will require a larger safety margin of at least 0.25 inches away from the trim lines on all sides. It is also possible for the artwork to bleed to the edge, in which case 0.125 inches of bleed will be required. 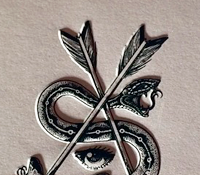 A reverse impression of the embossed artwork (known as a deboss) will show through to the other side of the card. You can use a 2-ply option where two cards are mounted together to hide the deboss on the back (leaving the back side flat) although this is only recommended with coated stocks. Some designers have found innovative uses for the deboss on the back of the card, incorporating both effects into their artwork. This is an effective design consideration that can create a very memorable card, however please keep in mind that if your embossed artwork includes embossed text, it will only be forward reading on the embossed side.